"Fruity flavors and racy hot peppers make this a zingy accompaniment to poultry or pork." 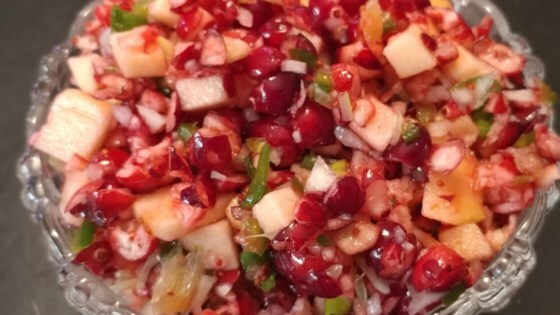 Mix cranberries, apple, orange, sugar, shallot, jalapeno pepper, green onion, lime juice, and vinegar together in a bowl. Cover bowl with plastic wrap and refrigerate for flavors to blend, 4 to 24 hours. I doubled all the ingredients for a party of 8. This salsa was the perfect mixture of spicy and sweet. I recommend making it for a Thanksgiving app. Very good. A bit different. Got lots of compliments.